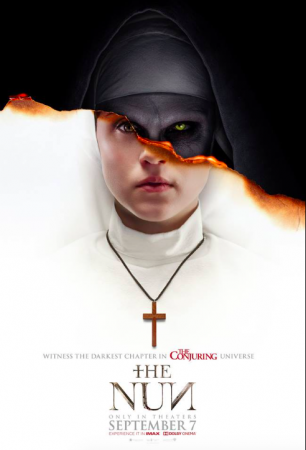 As part of an innovative marketing strategy, The Nun movie makers uploaded a short teaser advertisement on YouTube. YouTube took off the ad but there are several places where you can still watch the scary nun teaser. YouTube was at the receiving end of harsh criticism after it featured a horror advertisement taken from the upcoming The Nun movie. Following the backlash, YouTube took off The Nun ad but there are still many places and channels where you can view the banned advertisement. As part of an innovative marketing strategy, The Nun movie makers uploaded a short teaser advertisement on YouTube. The six-seconds ad starts with a volume sign decreasing until it reaches mute — somehow producing an impression to the viewer that the volume of his/her system is automatically decreasing, and then all of a sudden, the nun appears on the screen as part of a horrific jump-scare. After the short advertisement went viral, many fans have complained to YouTube and pointed out that The Nun advertisement is annoying and disrespectful to many. Some were angered by the company, with hundreds of people coming to Twitter with their own perspectives on the ad. As per a report from Deadline, the video violated YouTube's "content policy." Even YouTube released a statement stating they strive to avoid offending anyone. The company noted that the released ad violated their ban on shocking content in promotions. The short advertisement was followed by the previously released trailer that debuted in June 2018. In the trailer, the 23-year-old Taissa Farmiga is shown as a nun with a supernatural connection to an evil entity. The trailer was filled with several jump scares, including a voice change while viewing an image of the nun. The upcoming gothic supernatural horror film, The Nun is directed by Corin Hardy and is said to be a spin-off of the earlier release The Conjuring 2. The film is set in the early 50s in Romania where a nun, a novice, and a Catholic priest are sent by the Vatican to investigate the recent suicide of 'The Nun' at a monastery. Based on the screenplay written by Gary Dauberman, who in the past has written for films like, Annabelle, Wolves at the Door, Annabelle: Creation, and most recently, Stephen Kings' It movie, The Nun is scheduled to release on September 7, 2018.